SanDiegoVille: The 4th Annual Mission Valley Craft Beer & Food Festival | Going Out With A Bang! 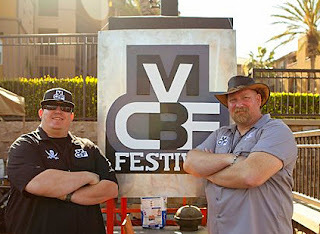 The 4th Annual Mission Valley Craft Beer & Food Festival | Going Out With A Bang! There's no better way to celebrate Sunday Funday than with all you can consume craft beer from 30 of the finest breweries in San Diego county paired with tasty offerings from nearly 20 of the best local chefs and restaurants in America's Finest City! That was the setting at the parking lot of the Handlery Hotel for the 4th (and allegedly final) Mission Valley Craft Beer & Food Festival, which took place this past sunny Sunday, March 24th. If you missed out, you may not get another chance, but you can live vicariously through our experience! Let's ReCap!!! San Diego is host to so many beer-centric festivals that you can attend at least one every month. The Mission Valley Craft Beer & Food Festival differentiated itself from the lot (except maybe The Beer Garden at The Lodge At Torrey Pines) by focusing equally on providing patrons with the best in San Diego craft beer and upscale food offerings from some of the hottest in our thriving restaurant industry. In attendance were such hot spots as Carnitas Snack Shack, R Gang Eatery, Farmhouse Café, Local Habit, Sea Rocket Bistro, Delicias, Slater's 50/50 and more. Unlimited samplings of food and beer were offered throughout the day, although some brews and bites ran out far before the event ended, which is all too typical at such tasting events. It was a gorgeous day in San Diego for the final installment of the MVCBF Fest, and aside from the never-ending queue at the Slater's 50/50 booth, lines were very manageable, making it easy to get firsts and seconds of any favorite taste. Like most beer festivals, attendees were in great spirits, making it easy to find quick friends. Many participants dressed up for the event (Comic Con pre-show? ), which was entertainment all on its own, and live music from a corner stage kept the crowd invigorated throughout the day. Of the many offerings (full list below), we absolutely adored MVCBFF organizer Handlery Hotel's offering of stuffed mussels with andouille sausage. The stuffing used Hess Brewing's Ursus Augustus blood orange trippel which the mussels were also paired with - a smooth and delicious beer, definitely complementing the dish. We went back for seconds and thirds of this dish as well as the beer. Other favorites included Chef Hanis Cavin of Carnitas Snack Shack's braised pork cheek stuffed arancini ball lollipops, Farmouse Cafe's flatbread tuna melt, Brooklyn Girl's wild boar baby back ribs with kung pao glaze, and our favorite beer of the day was Societe Brewing's Harlot, a crisp and flavorful Belgian style pale ale. Chef Karl Prohaska of the Handlery Hotel explained the reason that that this year's Mission Valley Craft Beer and Food Fest would be the last: "MVCBF Fest IV is going to be our last. We’re going to pull back and focus on our smaller events following our original concept where the details don’t get lost in volume and we honor local craft beer and food; events like Chef Karl’s Country Boil with Societe Brewing and New Kids on the Block II, focusing on San Diego’s newest breweries. We’re going to do events that allow our Brewers and Chefs to do what they do best." If this year's MVCBF Fest is truly the last, organizers should take solace in the fact that they definitely went out with a bang! Toronado - Red rice mac salad with soy marinated short rib.